Short Attention Span: Well. Here I am! Suddenly, and without warning, BLOGGING! I thought long and hard about what to make my first post on this blog, how best to explain the meaning behind its title, how much I should make excuses for who I am, apologize in advance for what I post, the delicate science of introductions. And then I thought "Stuff it, Hair Fair". Turns out I'm not that ant. Or the watermelon. Instead, in this post, I am both represented and ably assisted by my good friend, Green Box. Yes, this Hair Fair I came up with the BEST PLAN EVER for being as un-laggy as I could muster. It's a refined art, you know. For the last 4 years I've been paring it down, with the whole ARC thing, and then the counting of the scripts, and all these things, following the rules on various posts that are trotted out at this time of year about what causes client-side and server-side lag, and tailoring my busy-time looks around that and -oh, it's full of dilemmas. In the end I either just strip off my hair and such, or don't bother at all, and instead wait until the excitement has died down after a week or so. Bu t last week, when I was pondering how to min imalize myself into the 21st century...well, you know - the second decade of the 21st century - I hit on the BEST IDEA EVER. It was so ridiculously simple! I couldn't believe I'd never thought of it before. It's the ultimate in minimalism. The Full Body Alpha. Yep, right there in the depths of the Library (specifically, Library - Body Parts - Alpha) you will find a file called "Invisible Avatar", which you wear, and take off all your prims and HUDS and stuffses. It's perfect for various reasons - there's no compromising on what hair to wear or do I dare wear eyelashes, or worrying about looking really stupid without your AO, you're invisible, dude! Like magic! Seriously, it's very liberating. The other wonderful thing that helped me tackle Hair Fair in the most efficient way possible brings us back to my sweet friend Green Box. 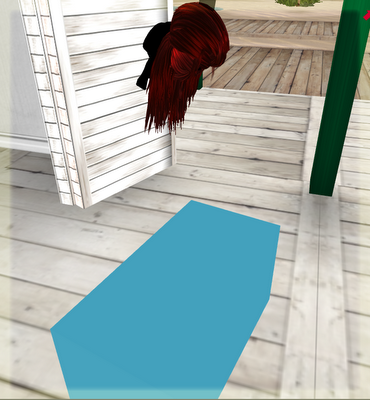 You might have noticed, at Hair Fair, and Hair Fairs of the past, the random-looking coloured prim boxes just sitting around, hovering and generally looking out of place . These boxes are, in fact, the single most awesome thing the organizers of any big fair/expo/event/extravaganza can provide for people to use. You see, you, the viewer, can move them yourself (as demonstated in the above picture of me enjoying one of Sasy Scarborough's lovely hot air balloons that decorated the sims). What you do is, you sit on the boxes, and move them around, instead of walking. Luxury! No more fighting against the lag to get to the next stall, and in conjunction with invisibility, makes you feel totally like a ninja, all s neaking along in big globs of stealthy movement. The point is - with a combination of my own sheer brilliance, and the forward-thinking of the organizers, Hair Fair 2011 has been a breeze and a blast and a general nice thing. Oh, and I did buy some hairs. Plenty. I'll probably sh ow them to you at some point, but I'm sure by now you've already seen them.